Welcome! As we are about half way through Winter and busy planning for the Toronto Knitters Frolic which is on April 28 I thought I might do a bit of a shop review of what I sell and update you with what is happening here. My focus from the beginning was alpaca and will continue to be my primary focus but I have also been adding some local wool which I think you will love. I enjoy supporting other makers in this community and have pottery yarn bowls, hand made soap, candles and as well as other alpaca products for gift giving. 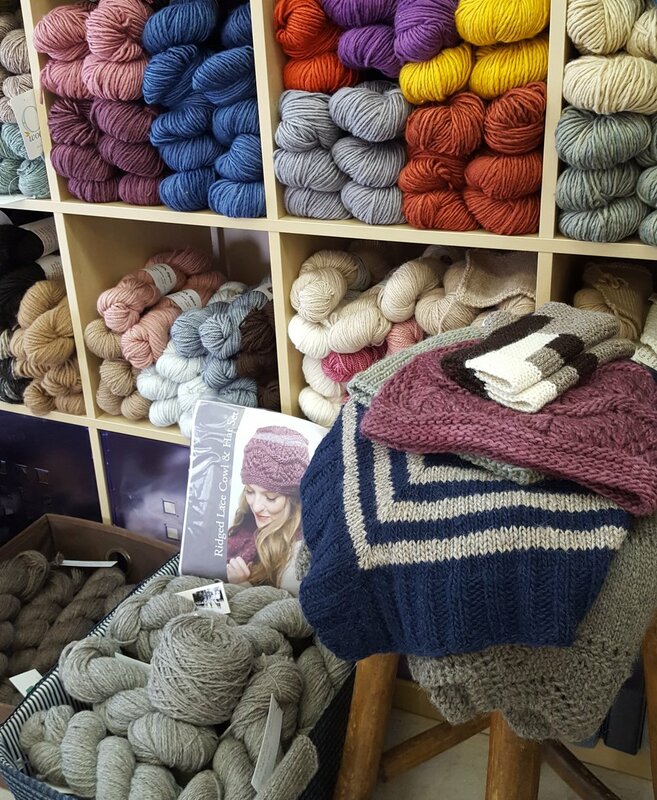 What yarns will you find at Alpaca Avenue? 1. 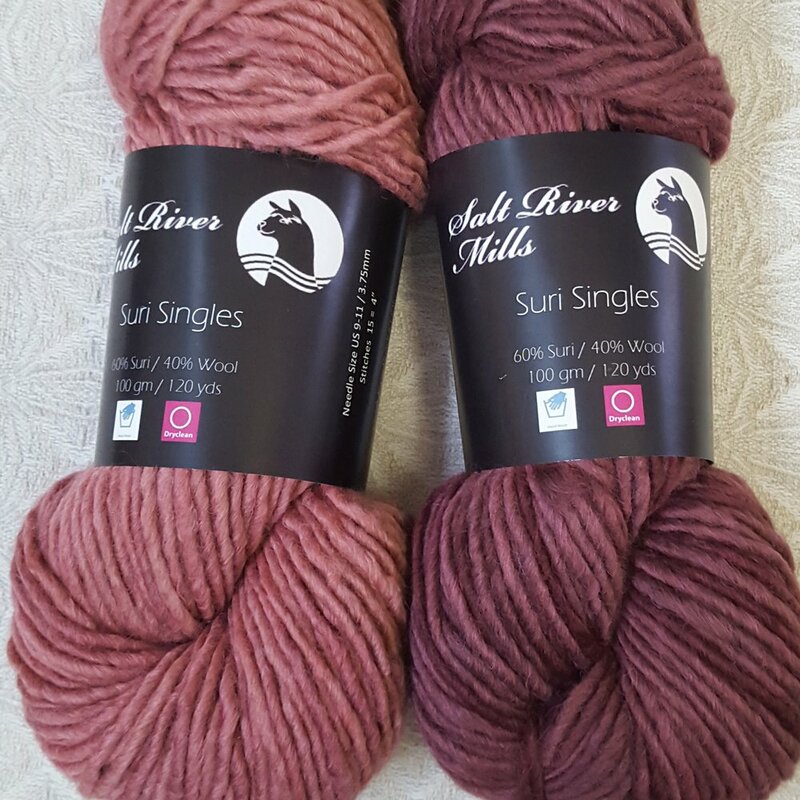 Locally farmed and milled yarns from Silver Cloud Alpacas, Highgate Alpacas and others. Mostly natural and occasionally dyed yarn and the interesting creative or rug yarn. 2. O-Wool Local 50/50 alpaca/organic wool blend in all the available colours. This is a wonderful slightly rustic, light worsted weight yarn that is lovely to work with and even better to wear as it has a comforting warmth. 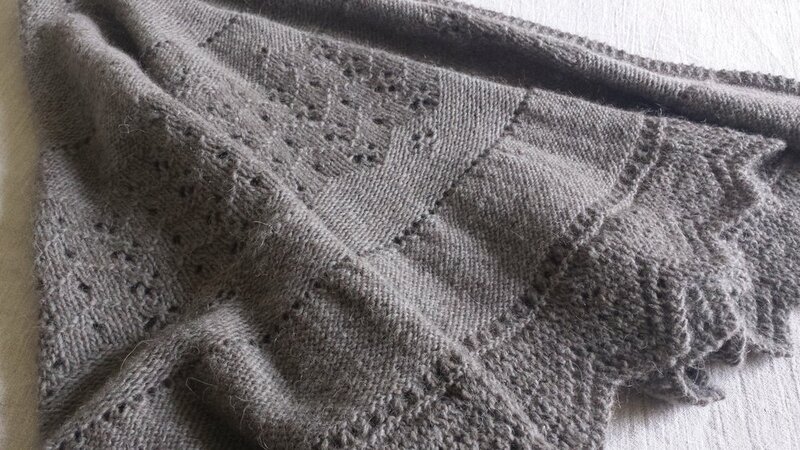 O Wool Local makes wonderfully cozy shawls. 3. Green Mountain Spinnery Alpaca Elegance is also 50/50 blend of alpaca/wool but in a dk weight. Available in 16 colours (natural and dyed) Suitable for colour work. New colours in Alpaca Elegance. 5. Sock Yarn hand dyed by Paula of Li'l Red KettleHead in Stout Sock BFL and Fine Foot BFL great not just for socks but for light shawls too. The book "Knitting Comfortably The Ergonomics of Handknitting" by Carson Demers is available on line and in the store. I only have a few in stock but more have been ordered. 6. 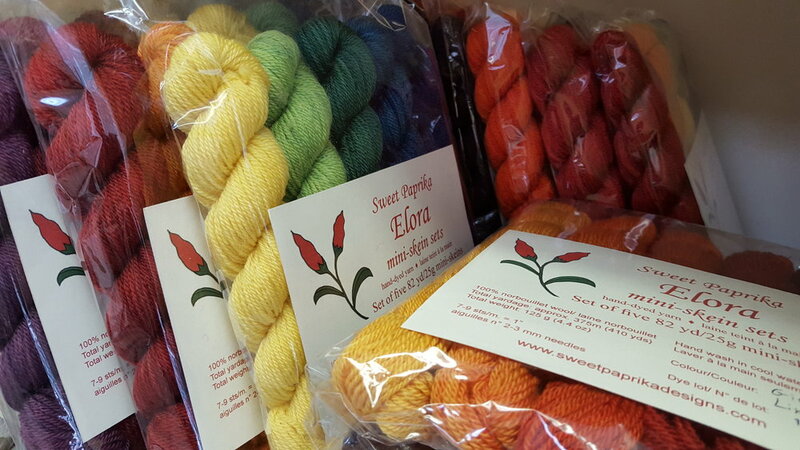 Sweet Paprika Yarns in limited selection. Elora Mini Skein sets and Norwood DK from locallly grown and milled wool which is hand dyed in Sweet Paprika's Studio in Montreal. I encourage you to visit the websites of the companies that I buy from to learn more about their passion and find pattern support and more of their products. Lastly! For about a year I have been aware of a special project that I have decided to support and I hope to soon have a few samples of botanically dyed Peruvian alpaca yarn in 2 weights to introduce you to Pichinku Yarn. My first order will not be in time for the Frolic but soon after and updates will be provided. Instagram is where I am most active and you can follow me there for the most up to date information. Visit https://www.etsy.com/ca/shop/PichinkuYarn to learn more! Well, there's more but I will leave you to come in and explore...You will be surprised at what can fit in a tiny space:) Happy knitting spinning or whatever you enjoy making.... make time for life reflecting and spending time with people! Mark your calendar for April 28 and see you at The Frolic!! !